There was a silent auction at the 2010 Men’s Basketball Hardwood Club Celebration Dinner for the Syracuse University Orange team last night. There was signed posters and jerseys of the players both past and present, donated items from local businesses and signed items from pro athletes and sports celebrates. By far the most interesting item was a signed basketball shoe. How much would you bid on it? It was up to $600 at the time I took this photo. All the money raised from the auction went to the Syracuse University scholarship fund. 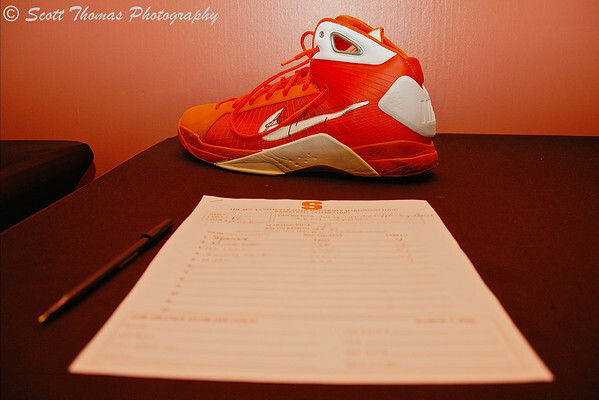 An autographed basketball shoe by Syracuse University players went for big money in this year's silent auction to benefit scholarship programs at SU. I will say the players shoe was signed by two of SU’s best this season. Syracuse University Basketball players Andy Rautins (left) and Wesley Johnson are the shoe signees. The shoe went for over $1,000 which should help a future student who is not as priveleged as the players who signed it. Good luck to Andy, Wes and the rest of the team in this week’s Big East Basketball Tournament! This entry was posted in Sports, Weekly View and tagged andy rautins, autographs, banquet, basketball, big east, new york, orange, players, shoe, syracuse, syracuse university, wesley johnson. Bookmark the permalink. Now there is two guys that can ball it up !! They got a shot in the tourney, I would like to see them match up with Kentucky I think the zone would give the Cats fits ! !